This is an especially important poster because it presents the new Sibley-Ahlquist bird classification system. Based on recent DNA studies, it uses cladistics to reconstruct the evolutionary family tree. Who would have thought that flamingos, eagles and penguins would end up in the same biological clade? However, this revolutionary new system has been widely accepted by North American ornithologists and has made the traditional bird classification system obsolete. Although these are true clades, they largely correspond to the earlier orders. The scientific community continues to use the order names, which are cited on the poster. This is a truly beautiful poster, one greatly appreciated by bird lovers. It certainly enhances the decor of their home or office. Yet it presents information that has even greater value. All the bird clades are explored and all of the many classification changes resulting from the transition from orders to clades are explained. 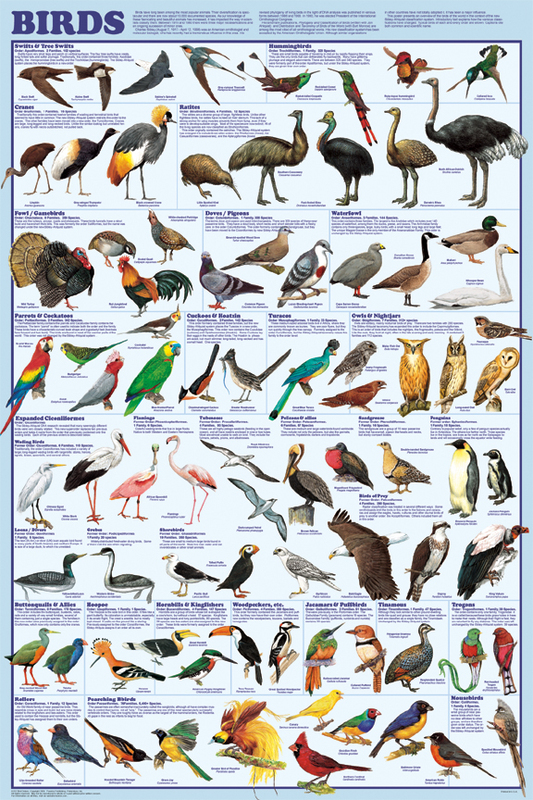 This information has never before been published in such a concise and convenient form, making this poster an essential reference to anyone seriously interested in birds.